Today, the Ullens Center for Contemporary Art (UCCA) presents Breaking Forecast: 8 Key Figures of China’s New Generation Artists, a groundbreaking exhibition showcasing a comprehensive look at the future of contemporary art in China. The exhibition will gather an exciting group of emerging and mid-career artists working throughout China today: Cao Fei, Chu Yun, Liu Wei, MadeIn, Qiu Zhijie, Sun Yuan & Peng Yu, Yang Fudong and Zheng Guogu. As UCCA’s first exhibition reviewed the history of contemporary art in China, two years later, Breaking Forecast focuses on its future, marking this show as a milestone towards the development of UCCA as an artistic organization with a global vision. Breaking Forecast brings together an influential group, who collectively embody the artistic thinking and creative vitality of Chinese artists in this new century. Utilizing a group exhibition to bring out the impact and influence representative of the new generation, the exhibition indicates that China’s contemporary scene is both energized and active. China’s new generation artists are flexible, open-minded, and free from the weight of local pressure and obsession. They have renewed methods of thinking and addressing problems, creating relevant art using a vocabulary that global audiences are also able to understand, and relate to. Experts in a range of media, this show offers a wide scope of what the new generation in China is developing. The artists are versatile, and apply suitable media towards a certain concept or idea – Breaking Forecast will include works combining the genres of painting, installation, performance, photography and film. The showing will consist of eight separate solo shows in one unified exhibition, purposefully placed to fit together like an intricate puzzle. Visitors will be taken on an epic journey through every corner of UCCA as artwork fills the exhibition spaces, facilities, and rooms. Displaying both new and recent works, Breaking Forecast affirms UCCA’s role as a production center, to help artists develop their talents, and to give them an opportunity to create something new. UCCA is committed and will continue to develop the new generation of artists, both in China and the rest of the world, in addition to providing unique exhibitions that will influence the history of today, tomorrow, and our future. Artists’ talks and workshops will be organized accompanying this exhibition to provide in-depth opportunities for the public to communicate with the artists, and to learn more about the ideas and stories behind their works. Please visit the UCCA website www.ucca.org.cn for more details and updates. UCCA would like to thank LVMH for their support to this exhibition, and their shared understanding of the creativity of China’s new generation artists. At the entrance of the show, Chu Yun's work "Masterpiece". A flower arrangement where the words "Create a masterpiece" are written. This work was exhibited in Frankfurt last month (please click here for more information). Then another work by Chu Yun "Constellation" consists in a dark room filled with various equipments that we regularly use nowadays (computers, etc), but only their little lights can be seen creating a constellation...(This work was produced for the exhibition "It's all right" in 2006 in Hangzhou and was presented in the last Venice Biennale "Making worlds"). Sun Yuan and Peng Yu's new work is composed of both artists ideas: one created a machine which produces smoke circles while the other made a machine with a rotating broom that dissipates the smoke. 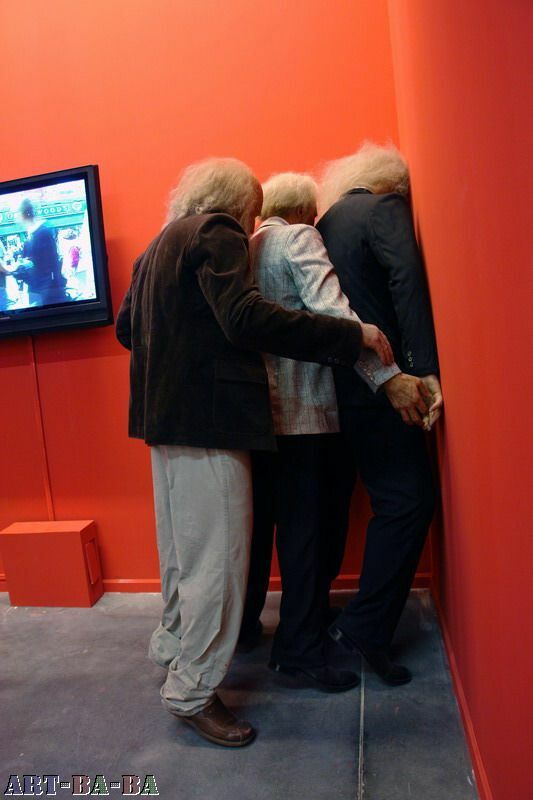 Next to these installations, another work produced in 2006 with human like statues of old men. Next to Sun Yuan and Peng Yu's work, is Liu Wei's installation "Love it, bite it". He added the cctv buildling that burnt few months ago. Some paintings surround the installation. Then an installation made of trees that was shown in his solo exhibition at Boers-Li last month (please click here for more information) and objects severed according to photographs.